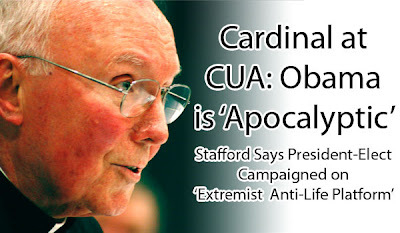 James Francis Cardinal Stafford told an audience last night that America’s future with Obama as president will be like Jesus’ agony in the garden. The lecture, hosted by the Pontifical John Paul II Institute for Studies on Marriage and Family, pertained to Humanae Vitae, a papal encyclical written by Pope Paul VI in 1968 and celebrating its 40 anniversary this year. Stafford also spoke about the decline of a respect for human life and the need for Catholics to return to the original values of marriage and human dignity. McCain thinks that Barack Obama is “a decent and honorable man” but the Vatican knows differently. A “decent and honorable man” would not support legislation that refused aid to a baby who survived a failed abortion, thus allowing the child to perish—to put the child to death. A “decent and honorable man” would not support abortion in the first place. Indeed, is there anything—anything at all—in the life of Obama that could possibly be described as “decent and honorable”? More than 90 percent of blacks voted for a man who supports the murder of half of all conceived black children.